As co-founder and director of Josie’s Place since 2007, Murphy knew that her program was unique in San Francisco. Its free evening and school-based groups for children who have lost loved ones has served hundreds of grieving children and their families and trained 130 volunteers to lead those groups. Murphy and Andrea Bass, associate director, train clinicians and staff at local mental health agencies and schools on how to work with grieving children and teens. They also keep an extensive resource list of similar grief programs outside San Francisco, camps, national programs and literature. And Murphy and program volunteers provide critical incident response to schools and businesses following a loss in their community. Despite capacity groups and increasing calls for Josie’s Place services, Murphy balked at the award idea. After that, things moved fast. Hallisy sent the nomination to the local Jefferson Awards Foundation on a Wednesday in August. The next Monday, KPIX-TV, a CBS affiliate and local Jefferson Award media partner, called Murphy to say she was an award winner. 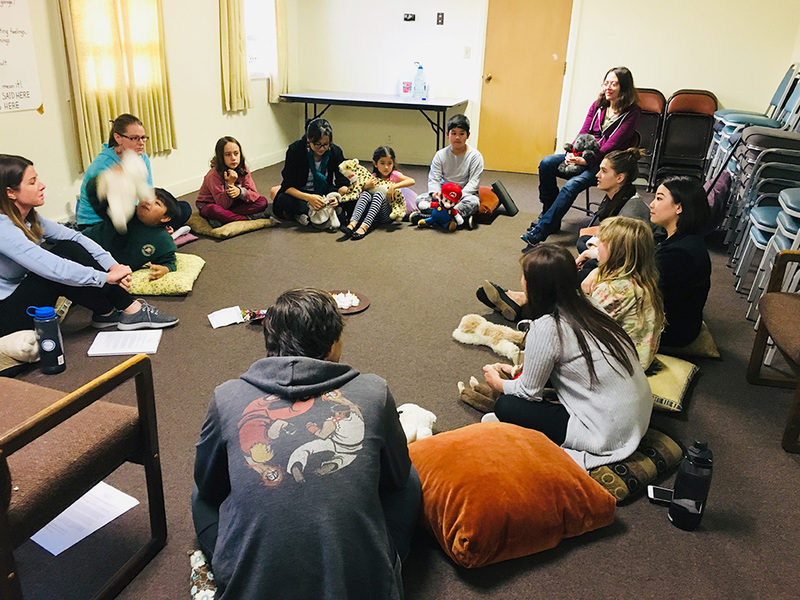 Ten days later, the station sent a team to Josie’s Place — a modest three-room space she rents in a church — where they filmed Murphy, a volunteer facilitator, and a mother and child in the program. The next week the two-minute segment aired multiple times on the station and on KCBS FM radio. The Jefferson Awards, established by Jacqueline Kennedy Onassis, U.S. Sen. Robert Taft and social entrepreneur Sam Beard more than four decades ago, honor people for exceptional public service. Besides the annual national awards, media partners — 125 newspapers and radio and television stations in 70 communities — make more frequent local awards to “unsung heroes” like Murphy. 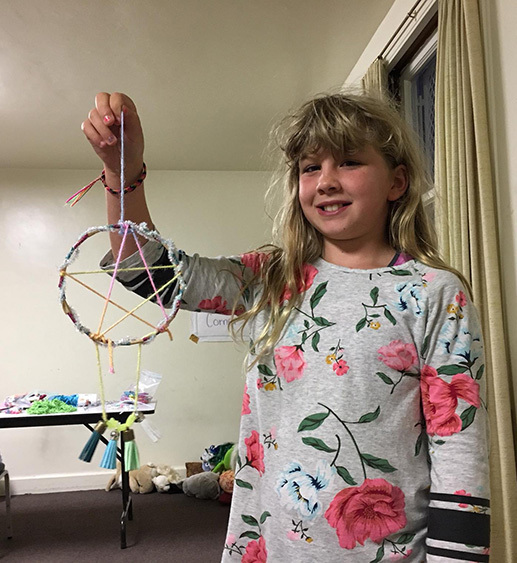 Alaia Haberman, 9, holds the dreamcatcher she made — its webs catch the frightening bad dreams, common following a loss, and let the good dreams pass through. Kids keep the dreamcatchers by their beds at night, for protection. Murphy, 70, a certified life coach, came to her work from her own experiences of death: She was 4 years old when her mother died of breast cancer and a young adult when her stepmother, who raised her, died. Both were named Josephine. Josie’s Place offers a twice a month, 90-minute evening group for up to 12 kids, ages 5-12, and another for teens only because their needs are different. Parents of both younger and older children meet separately, and most families stay in the program for two years. “This isn’t counseling— it’s peer-to-peer support,” Murphy says. The children tell their stories of loss in “talking circles,” and do art and activities that encourage them to express feelings like sadness, anger, anxiety. In a room together, they see how others are processing grief and recognize that they’re not alone. A 20-minute free time where the kids can let off steam before the group ends for the evening gives the kids time to transition to reality: Waiting at home are school work, chores and the place where one family member is gone forever. Healing takes time. The touching and stepping away recede slowly. While the youngsters meet, their parents share their experiences with death in an adjoining room. They learn how loss affects children at different ages and how to help them cope and adjust. Josie’s Place also has offered grief support groups in nine San Francisco elementary, middle and high schools. The students meet for about 50 minutes during the school day. Murphy says the groups, once a week for eight weeks, are a critical part of her program’s services: For some kids, this is the only grief support they receive. “We work closely with school counselors to find students who are most appropriate for a group. The groups can be challenging because there’s limited time for activities — we have to leave time at the end for the kids to defuse before they return to class.” Emotions run high in the groups, and facing fellow students immediately afterward is difficult and even embarrassing, especially for peer-sensitive teens. It’s also hard to get teens to agree to join a group in the first place and to keep coming. “Some of them won’t even look at me at first,” Murphy says. 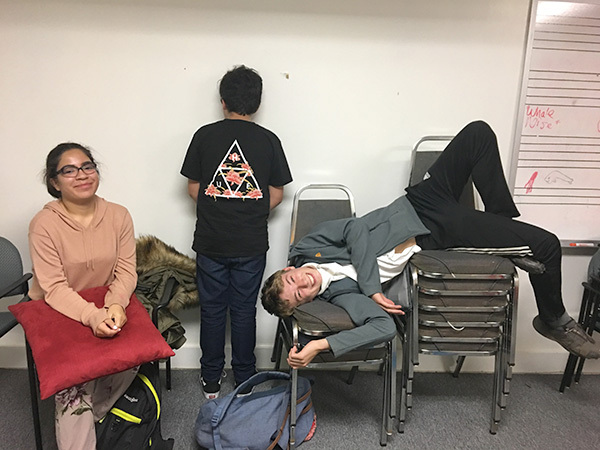 Three teens at Josie’s Place, from left, Brianna, Gabriel and Dylan, chose their own poses for this shot. She recalls one young teen in a Josie’s Place evening group who had been referred by her school counselor because “the joy had gone out of her life” after her father died. Depressed and isolated, she wouldn’t make eye contact with Murphy at first. The counselor told Murphy, “I don’t know what you do there, but her change is magical.” Murphy prefers to see the change as what’s possible with time, care and support. Despite the successes of Josie’s Place, a fiscally sponsored project of San Francisco Study Center, Murphy isn’t sure she wants to change much about its modest structure. She’d like to offer groups in more settings, like Boys & Girls Clubs. But for participants, she thinks a twice-a-month group works best because it reinforces the idea that grieving families will heal. Meeting more often could become a burden for kids, so busy with after-school activities, and working parents, already struggling with complicated schedules. Marjorie Beggs is the Study Center senior writer.